Poland took the 24th place in the latest ranking “Doing Business 2017″, created and carried out by the World Bank, one rank higher than the previous year and up by 51 compared to 2009. ”Doing Business” report has been published since 2003 by the World Bank. It contains a description and comparison of business conditions in different countries of the world (the last report contains information from 190 world economies). The research analyses the rules governing the activities of companies in the field of, inter alia, obtaining permits, paying taxes and international trade. “Doing Business” sheds light on how easy or difficult it is for a local entrepreneur to open and run a small to medium-sized business when complying with relevant regulations. ”Doing Business 2017” presents quantitative indicators on business regulations and protection of property rights that can be compared across 190 economies, from Afghanistan to Zimbabwe, over time. 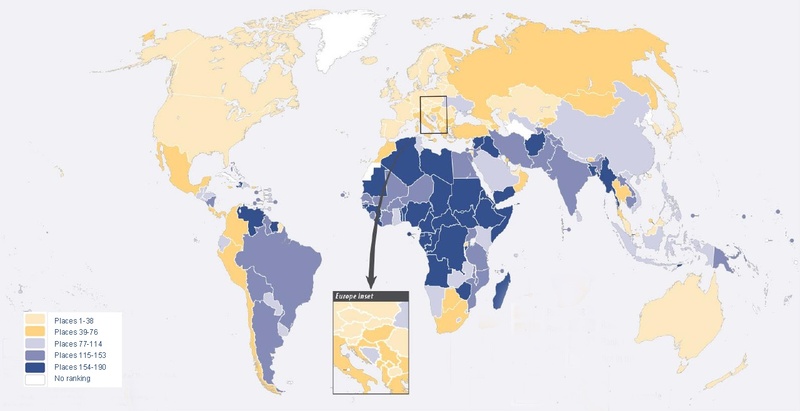 The data set covers 48 economies in Sub-Saharan Africa, 32 in Latin America and the Caribbean, 25 in East Asia and the Pacific, 25 in Eastern Europe and Central Asia, 20 in the Middle East and North Africa and 8 in South Asia, as well as 32 OECD high-income economies. the distance to frontier score (DTF), indicated on a scale from 0 to 100, where 0 represents the worst performance and 100 the frontier. The distance to frontier score benchmarks economies with respect to regulatory best practice, showing the absolute distance to the best performance on each “Doing Business” indicator. starting a business: procedures to legally start and operate a company, time required to complete each procedure, cost required to complete each procedure, paid-in minimum capital. dealing with construction permits: procedures to legally build a warehouse, time required to complete each procedure, cost required to complete each procedure, building quality control index. getting electricity: procedures to obtain an electricity connection, time required to complete each procedure, cost required to complete each procedure, the reliability of supply and transparency of tariffs index, price of electricity. registering property: procedures to legally transfer title on immovable property, time required to complete each procedure, cost required to complete each procedure, quality of land administration index. getting credit: strength of legal rights index, depth of credit information index, credit bureau coverage, credit registry coverage. protecting minority investors: extent of disclosure index, extent of director liability index, ease of shareholder suits index, extent of conflict of interest regulation index, extent of shareholder rights index, extent of ownership and control index, extent of corporate transparency index, extent of shareholder governance index, strength of minority investor protection ind. paying taxes: tax payments for a manufacturing company in 2014, time required to comply with 3 major taxes, total tax rate, postfiling index. trading across borders: documentary compliance, border compliance, domestic transport. enforcing contracts: time required to enforce a contract through the courts, cost required to enforce a contract through the courts, quality of judicial processes index. resolving insolvency: time required to recover debt, cost required to recover debt, outcome, recovery rate for creditors, Strength of insolvency framework index. In the latest edition, with 190 countries rated, the winner was New Zealand, which overtook Singapore – the leader of the previous years. Third place went to Denmark. The “top ten” also includes: 4. Hong Kong, 5. South Korea, 6.Norway, 7.United Kingdom, 8.United States of America, 9.Sweden and 10.Macedonia. In the second and third tens were beside Poland: 11.Tajwan, China, 12.Estonia, 13.Finland 14.Latvia, 15.Australia, 16.Georgia, 17.Germany, 18.Ireland, 19.Austria, 20.Iceland, 21.Lithuania, 22.Canada, 23.Malaysia, 24.Poland, 25.Portugal, 26.United Arab Emirates, 27.Czech Republic, 28. Netherlands, 29.France and 30.Slovenia. This year’s 24th place for Poland is the highest we have ever managed to get. In 2009, Poland occupied 76th place. Promotion by one place compared to last year was made possible by the introduction of laws restructuring and amendment of construction law. Our country came out best in the category of “foreign trade, the number of documents, signatures and the time required for a trader to be able to import or export” (for several years Poland ranks first in this category). 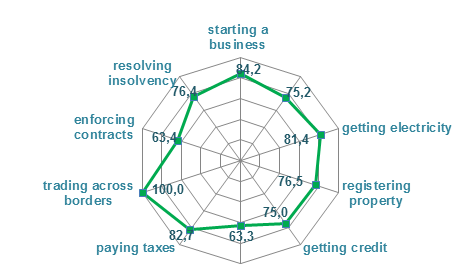 Poland showed the worst results in terms of “starting a business” and “enforcing contracts”. resolving insolvency – 27 (last year – 33).